German martial arts wunderkind Mike Möller is back with a great action film where he not only shows his impeccable action skills, but shows his acting side as well. Michael Schneider is a young fighter with a heart of gold. When he fends off some goons at a bar, he finds himself approached by two men, Frank and Salva. They have a proposition for Mike. They want him to fight and they will upload the video of the fights on a new website they will create. The first of Mike’s fights goes with a breeze. However, when he takes on a band of soccer hooligans, he finds himself arrested and interrogated by Ritter, a tough cop who thinks Mike is hanging out with the wrong crowd. As Mike becomes known because of his Internet fights, he soon learns it can come with a price. When he faces Lee Aang-Song, a former kung fu expert turned chef, as well as learning a secret about his estranged father, Mike begins to question his morals. When an impromptu bar fight lands Mike in the hospital with a near fatal stab wound, he is nursed by Lilly, whom he eyes. Surprisingly, Mike gets daily visits from Lee, who offers to help him with his chi. When Mike is discharged, he soon becomes a changed man, no longer willing to fight. He begins a relationship with Lilly and finds work as Lee’s restaurant. However, Frank is unwilling to let go and will go to any lengths to ensure Mike engages in one more fight, one he will lose. It was only a matter of time before we started seeing Mike Möller unleashed on the screen again after the 2012 action film Urban Fighter (aka Arena of the Street Fighter). The film is the first production of Silent Partners, founded by longtime Hong Kong film industry veteran Mike Leeder and German producer Ruediger W. Kummerle. Marco Theiss has crafted a great script that gives Möller a chance to not only showcase his amazing skills, but a chance to stretch his acting muscle as well. Möller plays the good-hearted Michael, or Mike as we know him. First, he comes off as someone who pretty much finds himself rejected when approaching a woman. Yet, he finds himself forced to fight. It is when he decides to take up Frank’s offer that we see him changed into a man who thrives on fighting. He has that look his eye that is just itching for a fight. Despite the pleas of his estrange fighter, Mike truly thrives until he lands in the hospital. The hospital scenes are where we see Möller stretch his acting muscle as he once again changes for the better to become a more pacifist man. The supporting cast is great in this. Sabine Steinbach plays the eventual love interest who finds Mike’s new pacifist ways enlightening while Li Yanlong makes a wonderful performance as his new mentor, Lee. Li’s previous film experience included a role in the 1984 film South Shaolin Master. Li does quite well here. One look at Martin Bader’s Frank and you will be yelling “schemer” and he fits the role while his partner Salva, played by Bartholomäus Kowalski, is sometimes uneasy when it comes to Frank’s decisions. Möller’s arch-nemesis from Urban Fighter, Volkram Zschiesche, nearly steals the spotlight in his scenes as Ritter, an unscrupulous cop who always has an eye on Mike. Möller and his team, the Psycho Dog Brothers, once again showcase their amazing athleticism with the martial arts action. When you see Mike Möller in action, you are definitely in for a treat, a very big treat. His moves are very smooth-flowing when it comes to his kicking skills and even adds a dash of lucha libre, using a sort of Hurricarana-bulldog combination at times. His triple kicks are just amazing to watch, including the move known as the “City Hunter” kick, named after a triple kick combination of a double jump back kick followed by a twisting front kick in one swooping motion that Jackie Chan had done in the 1992 film of the same name. 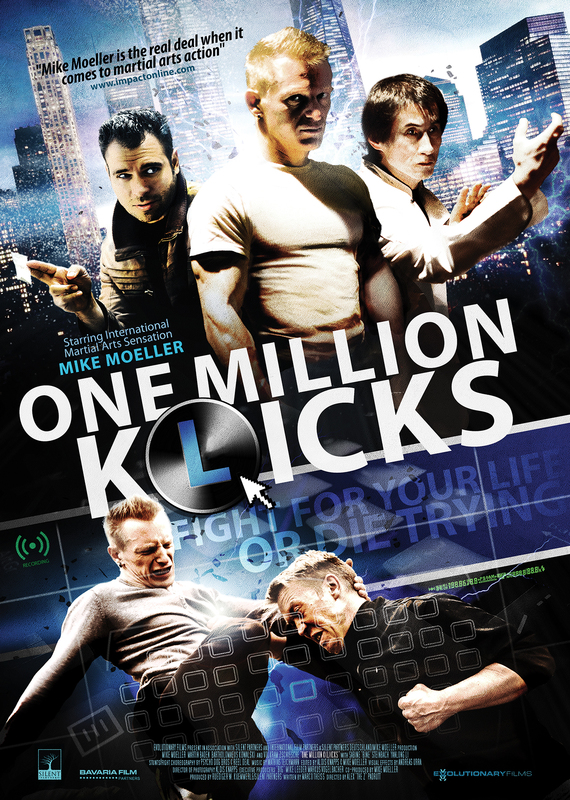 One Million K(l)icks is truly an action film fan’s delight with Mike Möller in one of his best roles yet. Möller is definitely a talent to look out for as he combines both the acting and fighting skills to boot. Evolutionary Films presents a Silent Partners production. Director: Alex Padrutt. Producers: Ruediger W. Kummerle and Mike Leeder. Writer: Marco Theiss; story by Theiss and Mike Möller. Cinematography: Alois Knapps. Editing: Alois Knapps and Mike Möller. Cast: Mike Möller, Martin Bader, Bartholomäus Kowalski, Sabine Steinbach, Li Yanlong, Volkram Zschiesche, Michael Bornhütter.